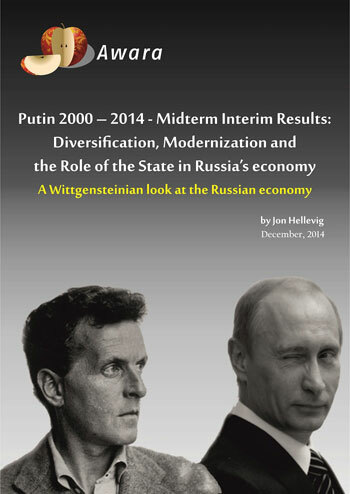 Awara Group releases study on Russian economy: Putin 2000 – 2014, Midterm Interim Results: Diversification, Modernization and the Role of the State in Russia's Economy - A Wittgensteinian Look at the Russian Economy. A study released today by Awara Group, a Russia-based consulting firm, shows that Russia's economy is not as dependent on oil and gas as is commonly claimed. Having researched the development of key indicators of the economy from 2000 to 2013. The crisis-torn economy battered by years of robber capitalism and anarchy of the 1990's, which Putin inherited in 2000, has now reached sufficient maturity to justify a belief that Russia can make the industrial breakthrough that the President has announced. The share of natural resources rents in GDP (oil, gas, coal, mineral, and forest rents) more than halved between 2000 to 2012 from 44.5% to 18.7%. The actual share of oil and gas was 16%. Russia's export growth has more than doubled compared with the competing Western powers. Oil & gas does not count for over 50% of state revenues as has been claimed, but only 27.4%. Top revenue source is instead payroll taxes. Russia's total tax rate at 29.5% is among lowest of developed countries, non-oil & gas total tax rate is half that of the Western countries. 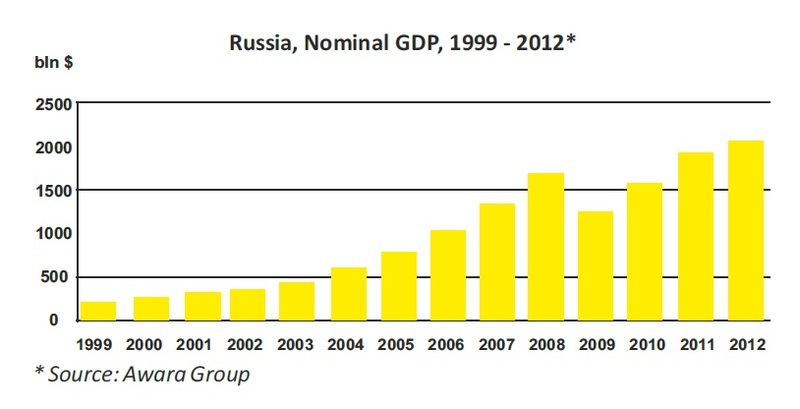 Russia's GDP has grown more than tenfold from 1999 to 2012. 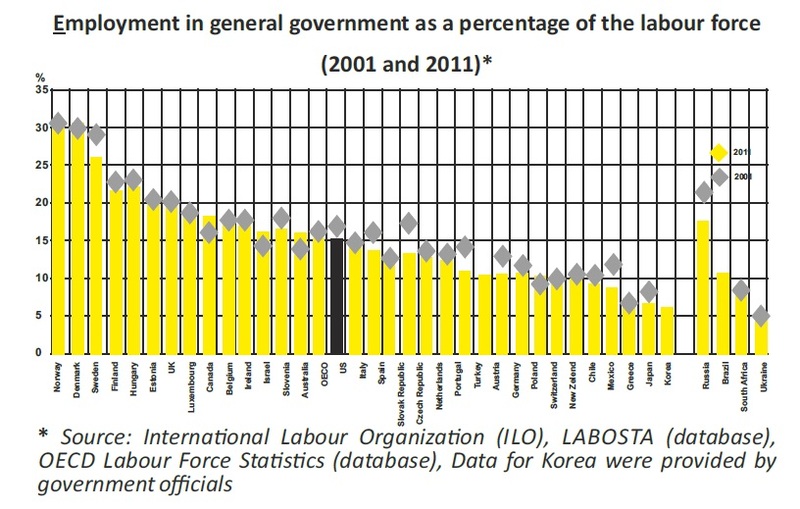 Public sector share of employment in Russia is not high in comparison with developed economies. State officials make up 17.7% of Russia's total work force, which situates it in the middle of the pack with global economies. Russia's labor productivity is not 40% of the Western standards as is frequently claimed, but rather about 80%. Far from "relying" on oil & gas, the Russian government is engaged in massive investments in all sectors of the economy, biggest investments going to aviation, shipbuilding, and manufacturing of high-value machinery and technological equipment. We strongly believe that everyone benefits from knowing the true state of Russia's economy, its real track record over the past decade, and its true potential. Having knowledge of the actual state of affairs is equally useful for the friends and foes of Russia, for investors, for the Russian population – and indeed for its government, which has not been very vocal in telling about the real progress. I think there is a great need for accurate data on Russia, especially among the leaders of its geopolitical foes. Correct data will help investors to make a profit. "The results of philosophy are the uncovering of one or another piece of plain nonsense and bumps that the understanding has got by running its head against the limits of language." 1. The share of natural resources rents in GDP (oil, gas, coal, mineral, and forest rents) more than halved between 2000 to 2012 from 44,5% to 18.7%. The actual share of oil and gas was 16%. READ MORE on page 25 in the PDF version. READ MORE on page 18 in the PDF version. 3. Production of food has grown by 100%. READ MORE on page 23 in the PDF version. 4. Production of cars has more than doubled at the same time when all the production has been totally remodeled. READ MORE on page 21 in the PDF version. 5. 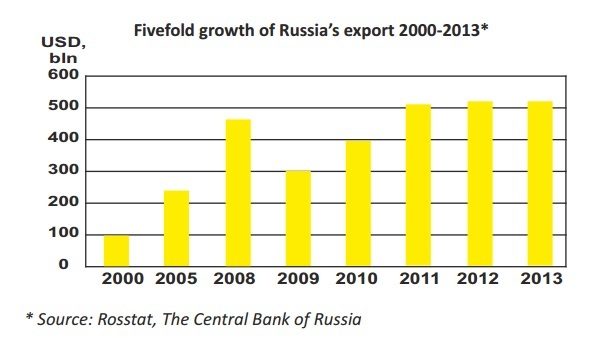 Russian exports have grown fivefold. READ MORE on page 11 in the PDF version. 6. Growth of exports of non‐oil & gas goods has been 250%. 7. 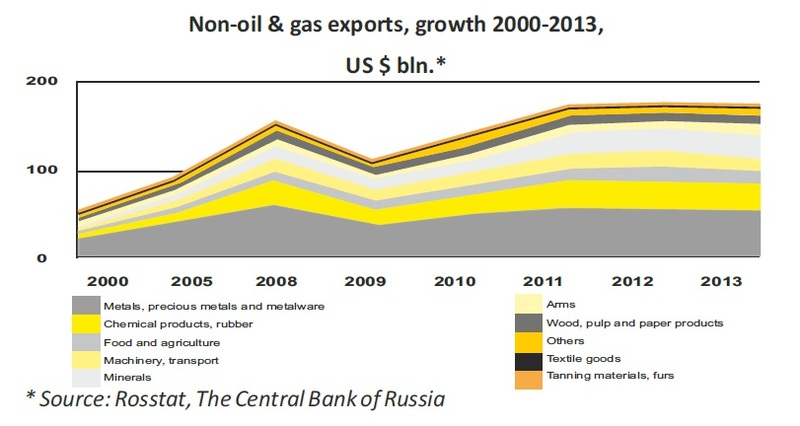 Russia's export growth has been more than doubled compared with the competing Western powers. READ MORE on page 12 in the PDF version. 8. Oil & gas does not count for over 50% of state revenues as it has been claimed, but only 27.4%. Top revenue bringer is instead payroll taxes. READ MORE on page 37 in the PDF version. 9. Russia's total tax rate at 29.5% is among lowest of developed countries, non-oil & gas total tax rate is half that of the Western countries. 10. Public sector employment in Russia is not high in a global comparison. READ MORE on page 28 in the PDF version. 11. Russia's GDP has grown more than tenfold from 1999 to 2012. READ MORE on page 36 in the PDF version. 12. Russia's labor productivity is not 40% of the Western standards as it is frequently claimed, but rather on the level of 80%. READ MORE on page 42 in the PDF version. 13. Far from "relying" on oil & gas, the Russian government is engaged in massive investments in all sectors of the economy, biggest investments going to aviation, shipbuilding, manufacturing of high‐value machinery and technological equipment. READ MORE on page 53 in the PDF version. Why is the coverage of the Russian economy so skewed and misguided? This study takes aim at disapproving the continuously repeated claims that Russia has supposedly not diversified and modernized its economy. Our report shows that it is especially false to claim that the Russian government has not done anything in this vein, that it would be "relying" on oil & gas rents and lacks an understanding that more must be done. Quite the opposite, the Russian state under Putin's leadership has devoted all its spare resources to address this problem; the early results are impressive and a lot of effort and strategic initiatives are currently being implemented. We are not implying that Russia's economy is in anyway in an ideal state - it clearly is not (then again, there is the question, the economy of which country would you characterize as ideal?). What we want to say is that the Russian economy has reached an initial maturity, which provides a solid platform for taking the next leap to further industrialization and development of a strong manufacturing industry utilizing the highest levels of technology. This is why we are confident that Russia will be able to make the "true industrial breakthrough" that President Putin recently announced. Putin envisions the creating of strong national champions in machinery and processing industries that will become major exporters of manufactured goods that are competitive on the global markets. Putin promises that this will also entail renewed investment in applied science and R&D in the fields of machine building and machine tool and instrument production. We strongly believe that everyone benefits from knowing the true state of Russia's economy, its real track record over the past decade, and its true potential. Having knowledge of the actual state of affairs is equally useful for the friends and foes of Russia, for investors, for the Russian population – and indeed for its government, which has not been very vocal in telling about the real progress. I think there is a great need for accurate data on Russia, especially among the leaders of its geopolitical foes. Correct data will help investors to make a profit. And correct data will help political leaders to maintain peace. Knowing that Russia is not the economic basket case that it is portrayed to be would help to stave off the foes from the collision course with Russia they have embarked on. In this report, we offer facts that should convince any reader who is interested in the truth that Russia has during the past decade achieved impressive results in lifting, restructuring, diversifying and modernizing the economy. 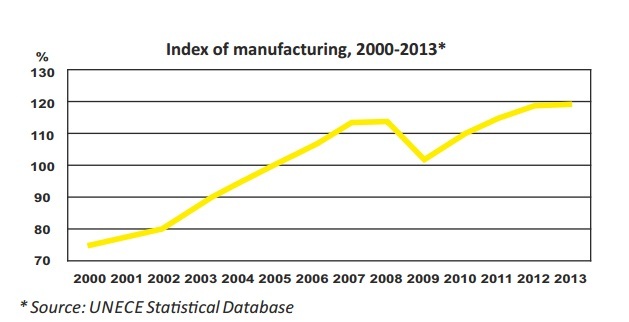 In view of this data, it is easy to believe that an industrial breakthrough will happen during the next 10 years. It is continuously argued that during the Putin era, from 2000 to the present, Russia has done nothing to diversify and modernize its economy, which supposedly only relies on oil & gas rents. This contention is ceaselessly repeated in economic analyses to the extent that it resembles propaganda more than analysis, as is the case, for example, with this article in The Telegraph. These kinds of ridiculous claims figure high in any Western business or political commentary on Russia. Such reporting passes for economic analysis for example in the writings of the tireless Putin critic Anders Aslund. Lately the narrative has been taken up even by leaders of rival countries. For example, Barack Obama, the president of the United States of America, who in view of the country's vast intelligence and analytical resources should be best informed about major trends in the world, permits himself to blurt that "Russia doesn't make anything. Immigrants aren't rushing to Moscow in search of opportunity. The population is shrinking," Obama is wrong on each count. We will here delve into the first, the question of Russia's industrial production and economic diversification. Former U.S. Secretary of State Hillary Clinton also thinks she knows that "Russia has not diversified its economy. It is still largely dependent upon natural resources, principally gas and oil." Lesser leaders around the Western hemisphere are parroting these same lines. Even Alexander Stubb, the prime minister of Finland, Russia's tiny neighbor, has got it in his head to spread these allegations about the supposed dismal and hopeless state of Russia's economy. We should wonder where they get these ideas. The most frustrating thing about the constant unfair criticism about Russia's economy – indeed of all its social and political practices – is the total ignorance about the time factor. There is no attempt to relate the state of Russia's economy and its progress to the time it has had to develop. In our opinion, the proper starting point from which we should count is the early 2000's and perhaps even as late as 2004. By this we mean the point of time when Russia first reached the minimum political and social stability which enabled the successive governments under Putin's leadership to start thinking about such mundane things as economic strategy and industrialization. Prior to that, since Putin took over the presidency in 2000, it had been a question of basic survival and establishing the elementary structures and reach of government throughout the entire country. The first few years of Putin's presidency can be characterized as having nurtured Russia in emergency care, reeling from the knock-out effects of the destruction of the Soviet economy, which had severely declined in the late 1980's and the ensuing anarchy and robber capitalism of the 1990's. As soon as the first opportunities emerged to work on positive development, Putin seized them. And after that, Putin has achieved phenomenal results in developing the economy and society at large. Ignoring the time factor and the chaos at the starting point, the self-styled Russia experts seem to want to compare Russia with the major Western countries that have developed in a market economy for hundreds of years. But even that is not enough; they don't only ignore the time factor, they also skew the comparative figures for Russia. We will show how. Wittgenstein: "What we are destroying is nothing but houses of cards and we are clearing up the ground of language on which they stood." 1. You cannot intelligently limit the story about Russia's economy – as the misguided analysts do – to the question about the share of oil & gas in exports without looking at all the other aspects of it. After all, the oil & gas industry does in no way squeeze resources from the rest of the economy. On the contrary, it takes up only 3% of the workforce and subsidizes the rest of the economy with the export revenues and high taxes. Contrary to what we are told, there is no risk whatsoever of the "Dutch disease" here. 2. According to World Bank data the share of natural resources rents in GDP (the sum of oil rents, natural gas rents, coal rents, mineral rents, and forest rents) more than halved between 2000 to 2012 from 44.5% to 18.7%. The actual share of oil and gas (net of other natural resources rents) was 16%. 3. The thesis that Russia's economy is a failure rests almost entirely on one single contention, the thesis – repeated ad nauseum - that "70% of Russia's exports are made up of oil & gas". This export figure is in itself true, but is by no means the end of the story. In this connection, the critics want to totally ignore the discussion of the impressive development of the domestic industry, the whole economy and the social structures. Exports are far from the only measure of how diversified an economy is. In any historic development of a national economy the process of satisfying domestic needs naturally comes first. This is what the misguided "Russia experts" fail to understand. 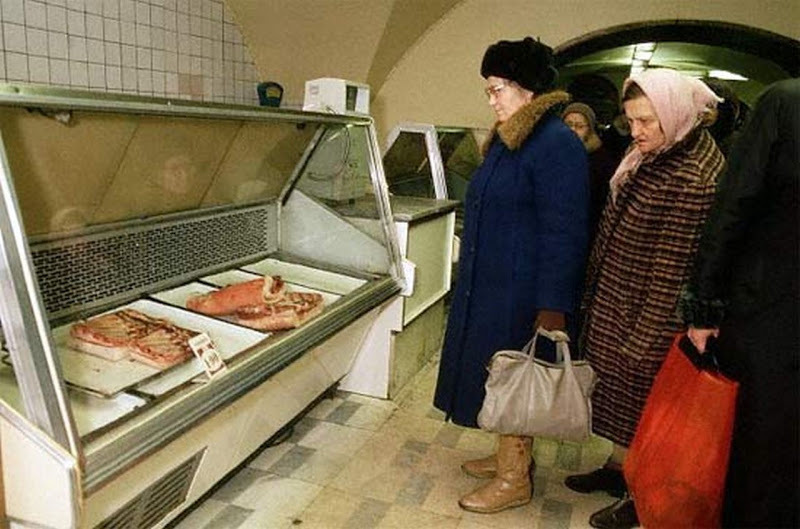 They don't want to see that Russia has in 10 years totally modernizing its economy and industry and filled the vacuum in supply after the fall of the Soviet Union. . It is only natural that in the first 10 years of economic restructuring you first supply the home market and move on to export markets only after you have satiated domestic demand. In these 10 years, Russia has indeed filled the vacuum on the domestic market with an impressive rise of 50% in industrial production. Because companies as economic actors do not strive to satisfy the whims of economic analysts but to make a profit, companies on the Russian market have during the reindustrialization of the country first supplied the home market. Very few enterprises could possibly afford to employ such a fool as a CEO who would refuse to sell on the domestic market and instead start with exports only to satisfy the demand to "diversify Russia's economy", as required by the Western and quasi-liberal analysts. No, corporations don't work for these analysts; they work with a profit motive for their shareholders, selling where they can make the best profit. 4. But even that is not the end of the story. If the analyst would examine the figures beneath the surface veil of "oil & gas making up 70%...", then he'd realize the that total exports have risen fivefold over 2000 to 2013 from $103 billion to $526 billion, and therefore exports of non-oil & gas products also grew by a whopping 250%. If this is not enough for 12 years, then what were they possibly expecting? A doubling every two years! More details on page 11 in the PDF version. 5. Besides this, the critics fail to notice that within exports of oil & gas proper there is an interesting diversification trend in that Russia has made a remarkable switch from exports of crude oil to exports of value-added refined products. Exports of refined oil products increased by 900% from $10.9 billion to $109 billion. The share of value-added oil products has risen relative to crude oil in total oil exports from 30.6% to 38.6%. More details on page 11 in the PDF version. 6. While the accusation is constantly being made that Russia has failed to develop strong exports of manufactured goods, it is ignored that very few countries in the world have been able to develop such exports. I invite the reader to list 10 countries, in addition to China, that have been able to do it during the last 20 years. 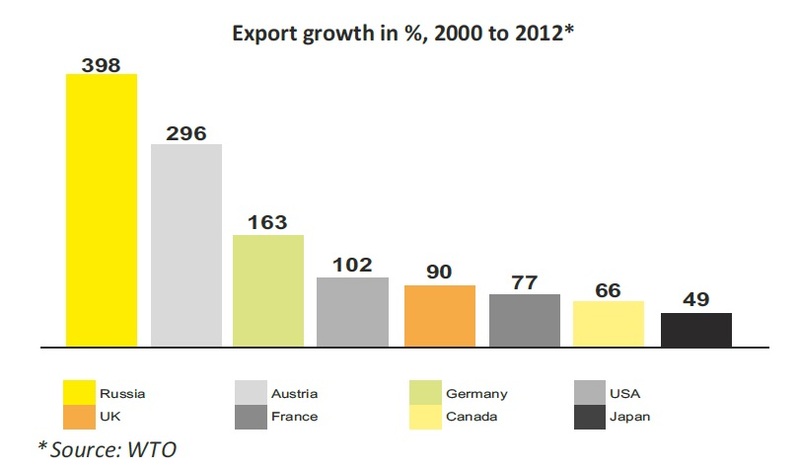 The same countries that dominated such exports continue to do it, albeit with falling volumes (except for Germany). Commodities prevail, as with Russia, in exports of two of the G7 countries, Australia and Canada. More details on page 12 in the PDF version. 7. 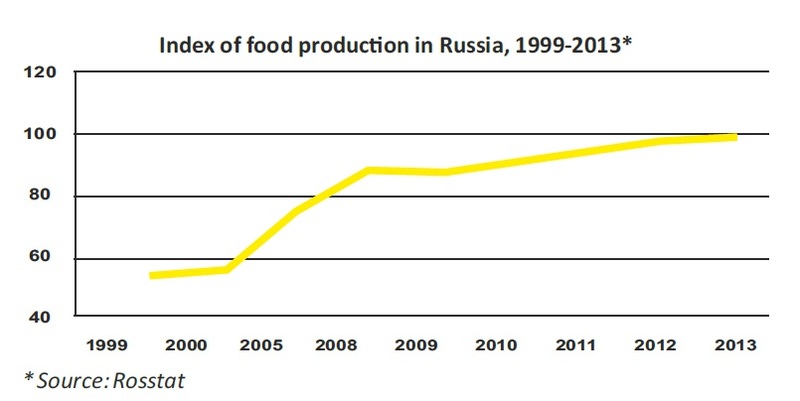 Russia's food production doubled from 2000 to 2013, at the same time that exports of food skyrocketed from almost nil to $16 billion. 8. We don't discuss in this report the growth of retail, but want to point out what all real experts should know - that the Russian retail sector over these years has undergone a total restructuring and modernization. Serious domestic and foreign retail chains have entered the market. Gone are the once ubiquitous shadow economy outdoor markets and rag fairs, having been replaced by modern malls, retail space and logistics centers. Naturally, retail had to come before production, and production before exports. 9. We are also puzzled as to the meaning of the claim that "Russia has not diversified its economy". Perhaps this is just another nonsensical statement that does not mean anything. One must understand that Russia is a market economy, and therefore the whole criticism that Russia has not diversified is wrong. For in this connection there is no "Russia", there are only a multitude of corporations that make their own business decisions. And for all we know they have made the right decisions in investing in Russia and satisfying the domestic market. By "Russia" then they can mean only the government. And here the question would be, whether the government (read, Putin) has not done enough to create the conditions for economic development, diversification and modernization. Our report provides the resounding answer that indeed he has. It would not be reasonable to expect any more impressive results for the first 14 years of this work. In addition to providing the conditions for enterprises to thrive, the state may also take a more active role in the economy. Have the Russian governments under Putin not done so? Yes, they have. It has been done by targeted, successfully implemented, strategic programs for developing various sectors of the economy and industry. Finally there is the question of direct state ownership in enterprises and investments in industry. Have the governments under Putin not done enough in this respect? No! – But wait a minute, isn't that what the critics want? "No government investment in industry" is their war cry. These critics want to have their cake and eat it, too. No diversification of the economy has happened, they falsely shout. 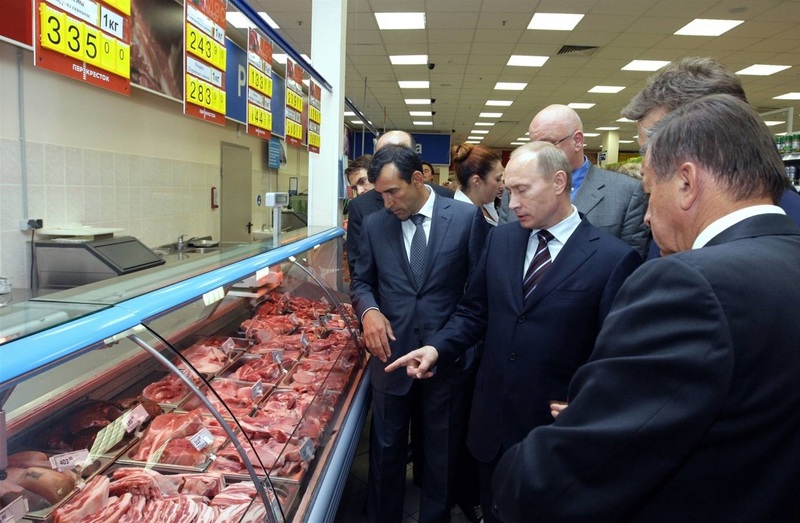 But at the same time they scorn all of Putin's initiatives to invest in industry. Well, fortunately their looney criticism is increasingly falling on deaf ears as Russia has established a solid platform for the future - moving on to the next stage of development of the economy with Putin's program to effect an industrial breakthrough. More details on page 49 in the PDF version. 10. Public sector. It is argued that the public sector of Russia is disproportionate. We will show that this argument as well is false and baseless. Russia's public sector is among the lowest among developed economies when measured on three key indicators. 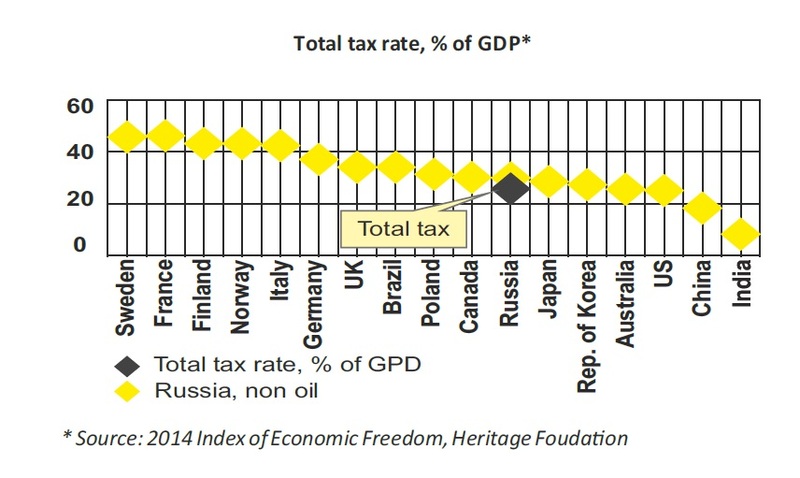 While Russia's total tax rate was 29.5%, the countries with developed Eurosocialism, like Finland, Sweden and France, had a total tax rate at the level of 45%. This means that the Russian government imposes significantly less taxes on its citizen and corporations than the Western countries. The size of the public sector may also be measured in terms of government spending as a percentage of GDP. On this figure, Russia also ranks significantly lower than most of the Western countries, being about 2/5 lower than the Northern European countries. Public sector share of employment in Russia is not high in a comparison with developed economies. State officials make up 17.7% of Russia's total work force, which situates it in the middle of the comparison with global economies. More details on page 28 in the PDF version. 11. Oil & gas revenue does not make up 50% of Russia's budget revenue as is commonly claimed, but only 27.4%. It is not even the biggest source of state revenue, which position is held by payroll taxes at 28.8%. More details on page 37 in the PDF version. But, notwithstanding that the share of oil & gas taxes is not as big as is commonly claimed, the oil & gas industry is heavily taxed. And this is not detrimental to the economy, as critics want us to think. Quite the contrary, the rather severe taxation of the oil & gas industry in fact means that it subsidizes the rest of the economy, which enjoys some of the lowest taxes of all developed nations. 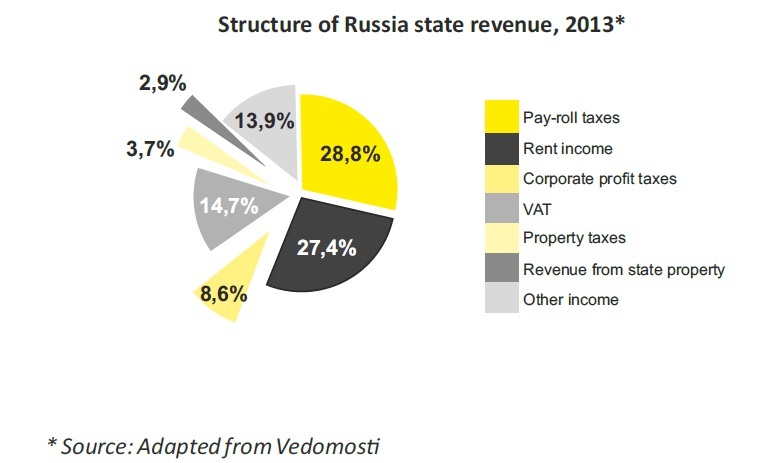 Russia's total tax rate net of oil & gas taxes is only 24.1% (2012). 12. Foreign direct investments. Critics constantly argue that Russia has not been successful in attracting foreign direct investments in its economy. This claim is also wrong, just like most of their supposed analysis. In fact, Russia has during the last three years attracted the third largest foreign direct investment flows of all countries in the world, right after the USA and China. When measuring the inflow of FDI as a percentage of a respective country's GDP, then Russia, followed by Poland, turns out to be the absolute leader for the years 2011 to 2013. Following the tax reforms and other major reforms of Russian society by Putin, such as strengthening the judiciary system and rule-of-law and public administration, the Russian gross domestic product (GDP) in dollar terms has increased tenfold since Vladimir Putin first took office in 2000. At end of 1999, the Russian nominal GDP was in US dollar terms 196 billion. By the end of 2012 the nominal GDP had risen to $2,015 billion. This represents a growth of more than 1000% in 12 years. More details on page 36 in the PDF version. 13. Russia's labor productivity is not at the level of 40% compared with developed economies, as critics claim. Rather, the whole method by which the measurement of labor productivity is supposedly derived using the GDP figures is wrong at best, and most probably outright nonsensical. The same applies to the method of comparing cross global labor productivity of companies by comparing sales revenue to workforce. More details on page 42 in the PDF version. 14. Critics habitually deny Putin any credit in the remarkable growth of the Russian economy since he took charge of the country. All is supposedly merely due to windfall revenues following sharp rises in the price of crude oil on world markets coinciding with his tenure. But, these same critics also hold against Putin the act of jailing the oligarch Mikhail Khodorkovsky. And yet, it was precisely the fact that Putin reined in the robber oligarchs and Khodorkovsky in particular that made all the difference. Only then was Putin able to pass legislation that ensured that Russia's vast oil assets were taxed for the benefit of the national economy and its people. More details on page 49 in the PDF version. Indeed, we are profoundly bewildered as to the unprofessionalism of the economic analysts and political pundits who pronounce on the Russian economy. How is it possible that they constantly miss the essentials? Not only do they fail in the analysis of the fundamental trends of the economy, but frequently they even get the facts totally wrong. In our great perplexity in this regard, we have been trying to let ourselves be guided by the old adage: Never ascribe to malice that which is adequately explained by incompetence. – But don't rule out malice, for to that extent is the analysis intellectually feeble. The economic and political observers who speak disparagingly about the Russian economy often claim that Russia (read Putin) "relies" exclusively on oil & gas revenues. As one analyst writes: "As much of the rest of the world struggles to cope with the fragmentation of manufacturing value chains and strives to move up the value-added ladder, Russia continues to rely on a largely commodity-based growth model". The gist of that argument is that President Putin is a reckless leader who does not understand or care about economic realities and future prospects, being dominated by short-sighted illusions that oil & gas rents would carry Russia from here to eternity. They portray Putin as a happy-go-lucky kind of a chap who spends oil & gas revenues without caring for developing the overall economy. Not surprisingly, our analysis shows that that is a lot of bilge as well. Totally contrary to the idea that Russia was wallowing in an oil & gas binge, it has in fact been using the oil & gas revenues to subsidize the development of all the other sectors of the economy. Another example of the "Russia relies on oil & gas" argument is provided by Dmitry Trenin from Carnegie Moscow Center. Trenin writes that Russia "lacks real economic strength" (we wonder what the definition is, in view of the data presented in this report) and rhetorically states: "unless it deals with this massive deficiency," Russia will be doomed. The implication is that Putin has not realized that the economy must be strengthened; nothing has been supposedly done and nothing achieved. Trenin says that, "Russia should work to…" – but he has not noticed any work, even though it is his job to monitor these issues – "…advance in qualitative terms: labor productivity; science and technology power; and the general quality of life of its people." And in the absence of that, Russia will "slide even deeper." We can well understand that Trenin may miss the points on science and technology when the approach seems to be so superficial (probably relying on the Economist and other such sources), but the failure by Dmitry Trenin as a Russian living in Russia to detect any improvement in "the general quality of life" of the Russian people we must unfortunately attribute to the malice factor. The charge that "Russia has not diversified" is also peculiar, not only because it is false, but also because the people that make the charge are usually either Western adherents of the free market theory or Russian domestic quasi-liberals. One may ask, who is this "Russia" that in their view has failed in this activity? They seem to be referring to the state and in particular Putin and his governments. But if so, then they are being very illogical according to their own ideology. We mean that they are the ones that claim that the state should stay out of the economy and not interfere in it. This being the case, how do they then think that the state has failed in the diversification? What should the state have done? Invest more in businesses? But wasn't that precisely what they oppose? It becomes evident from this report that the state has done a lot for diversification in all aspects: providing a favorable tax regime, improving the business climate, supporting companies and entire sectors of the economy to diversify, modernizing the economy. And quite recently Putin has announced that he will make these wishes of the critics come true with renewed heavy state investments in industry to create new strong national champions. But will that satisfy the critics, when their dream comes true? No, it won't, because nothing will. They are in fact preciously little concerned about the economy. Their motto is: "It's not the economy, stupid! Our business is Putin-bashing." The rest part of the article is available in the PDF. Click here to open the full article.